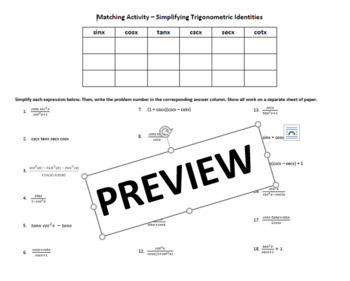 This activity consists of 18 problems where students match up the answer to each problem in the corresponding column. Students must use trigonometric identities including reciprocal, quotient, Pythagorean, and Double Angle identities to simplify each problem. Once finished, there will be three problem numbers in each column (to fill the whole chart). I really like this activity in my classroom because it's somewhat "self-checking". Students are able to realize they did something wrong if they didn't get an answer of sin(x), cos(x), tan(x), csc(x), sec(x), or cot(x) and sometimes can find their mistakes on their own based off of this idea alone. It's also easy to grade because the teacher can quickly check by simply looking at the numbers.